The word fragrance on a personal care product label can mask countless carcinogens and hormone-disrupting chemicals. Nature provided us with all we need to scent, clean, soothe and heal. Essential Oils are safe, natural solutions for your daily health and beauty needs. BAY- An aromatic cultivated mainly for culinary use. 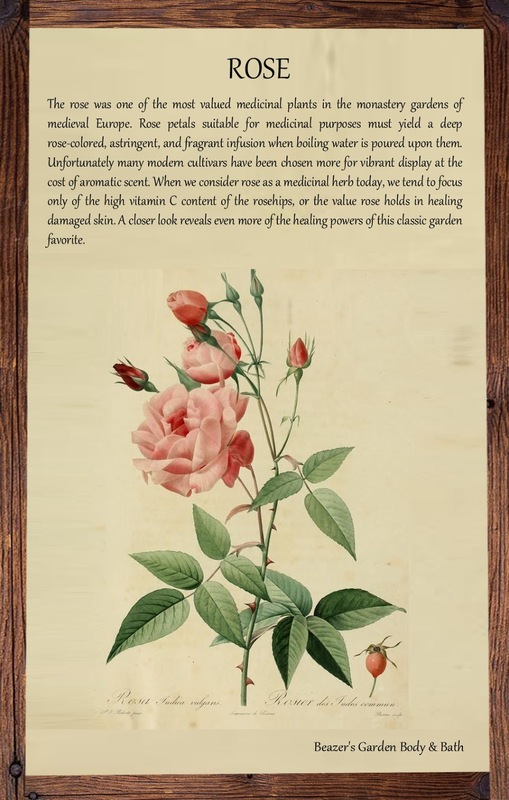 Has been used as a medicine, a spice, and decorative garland; was thought to be protective and the leaves were used as bandages to relieve wasp and bee sting. Induces healing and health. Used as a rub, eases arthritic aches and pains. 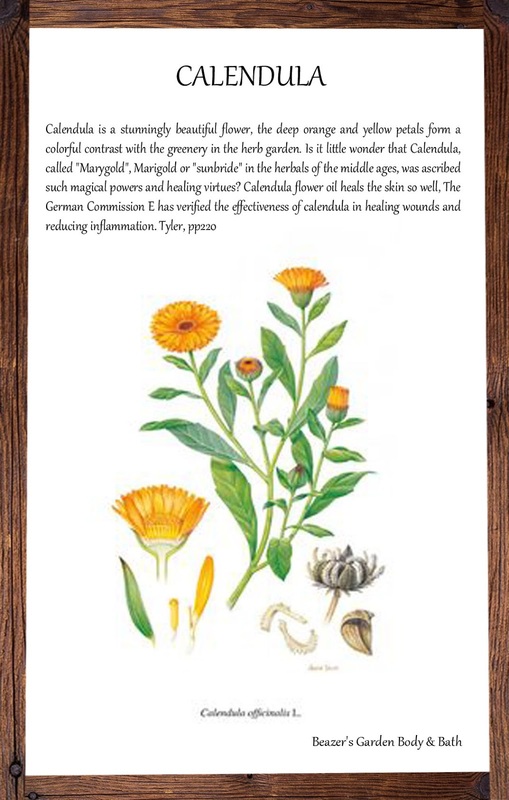 CALENDULA- One of the most versatile herbs! Excellent for red, inflamed skin, used to remedy skin disorders, cuts, scrapes, wounds, burns, acne, rashes, fungal conditions and speeds healing; antiseptic, prevents spread of infection; cleansing, detoxifying, antibacterial, astringent. 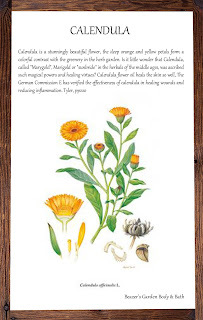 Experience the healing effects of calendula in my Total Body Butter Salve and Herbal Bath Teas. 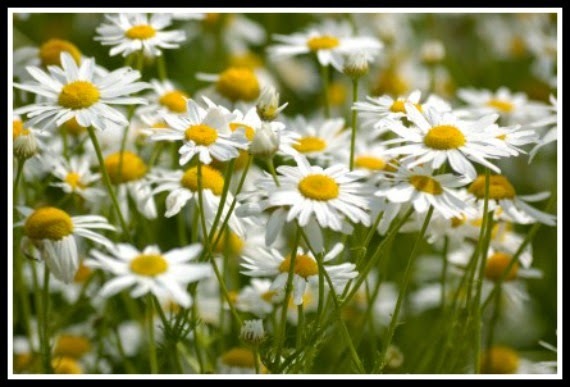 CHAMOMILE- Calming and soothing to our skin, nerves, and senses. Induces loving feelings, relieves anxiety, stress, depression, cramps, hysteria, headaches and tantrums; is suitable for use on children. 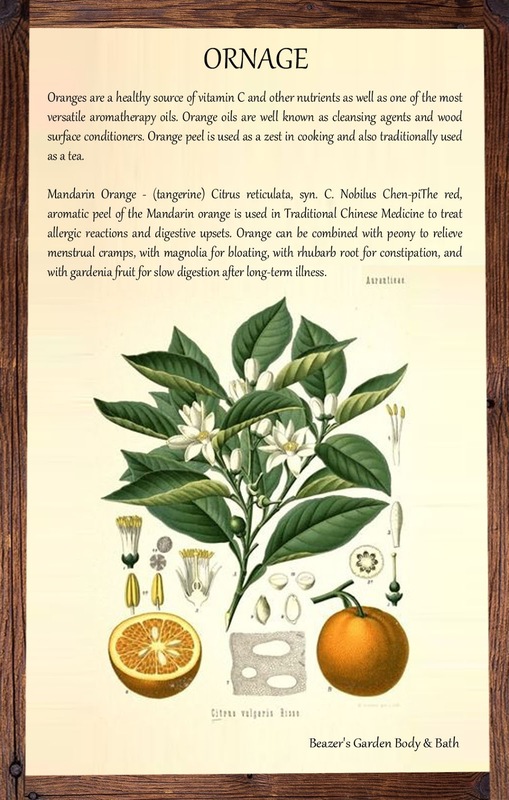 Most valued for its anti-inflammatory properties, it relieves skin problems, is antiseptic, good for sensitive and dry skin, clears burns, minor wounds, used in masks, compresses, massage, vaporizers, inhalations, baths, rejuvenation treatments; is also antibacterial, antiseptic, and a disinfectant. CARDAMOM- Native to India and one of the oldest spices in the world, the seeds and seedpods are used whole or crushed, is an aromatic and works well with other herbs. 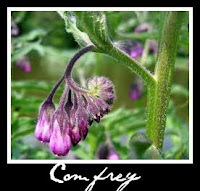 Used as a cooking spice, it is a digestive aid, settles indigestion and eases stomach pain & cramps. 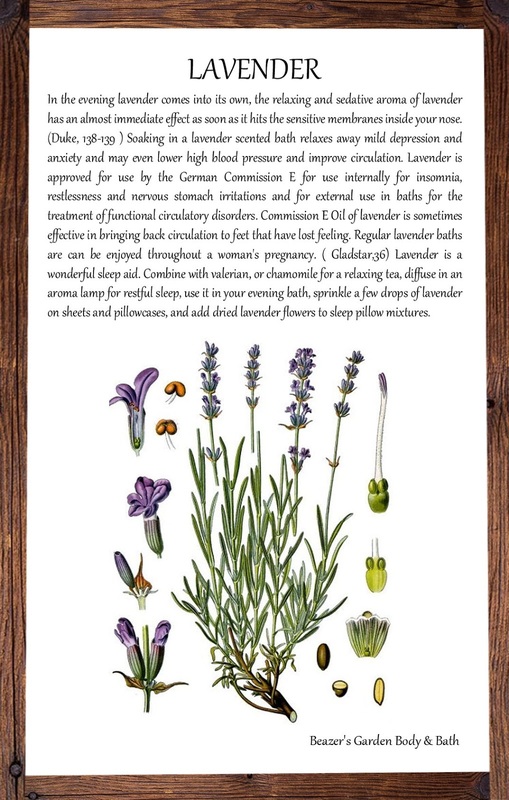 For medicinal purposes, are antispasmodic and used as an essential oil in infusions and tinctures to treat headaches; good in body rubs for bad joints, as a tonic, and an aphrodisiac. CARROT SEED- Rich in beta-carotene and vitamins A & E, highly beneficial to hair and skin. Topical application of this oil promotes the formation of new cells and stimulates the production of sebum in dry, scaly scalps and skin. CATNIP- Has a mild scent that induces happiness and loving feelings. Is a sedative and stimulates sweating, reduces fevers, helps relieves colds, flu. CAYENNE- Mainly used as a culinary herb. A warming stimulant that acts on the circulatory system. A tonic that induces healing and health, is an antiseptic, increases blood flow to the skin, relieves muscle spasms, a counter-irritant, can treat arthritis and headache, is anti-microbial. CEDAR- Harmonizing and calming with a mild, sweet and woody aroma. Antiseptic, ease respiratory ailments. Use for oily skin, acne, dandruff, eczema, greasy hair, and psoriasis. Also good for arthritis and rheumatism and as an insect repellent. Avoid during pregnancy. 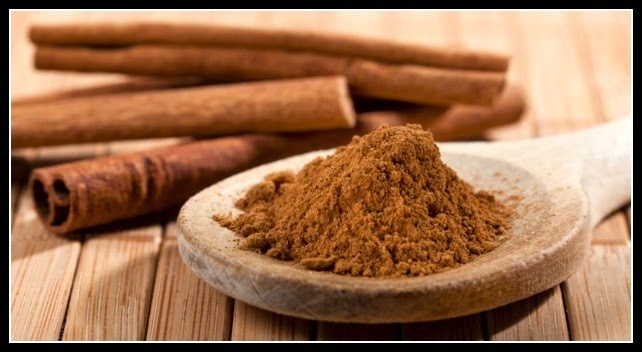 CINNAMON- An evergreen tree, where the inner bark and twigs are parts used. 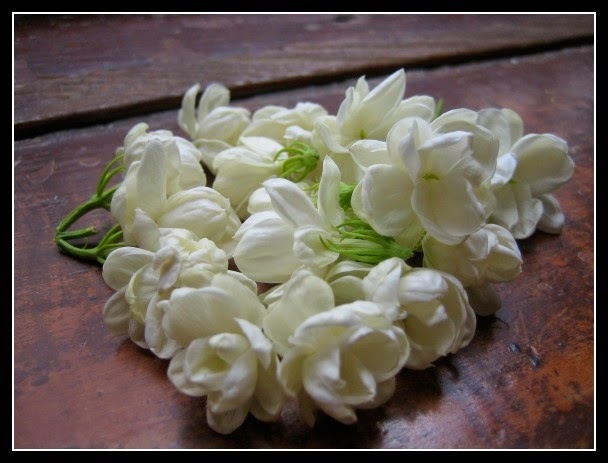 Has a wonderful warm scent, induces loving feelings and healing and health. Is an anti-viral that helps to relieve flu, colds, and infections. A stimulant, antispasmodic, antiseptic, reduces fevers. Stimulates circulation and digestion. 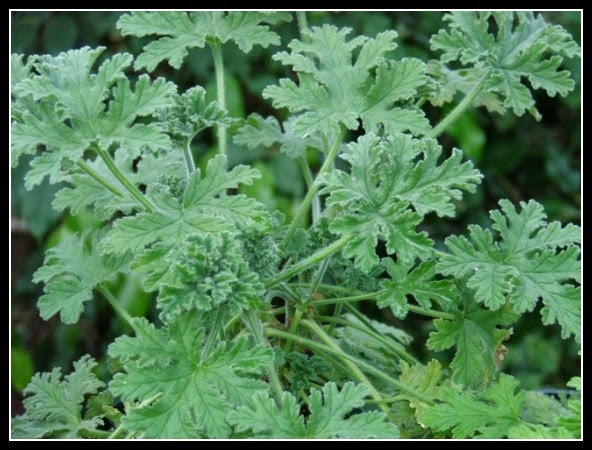 CITRONELLA- Great fresh powerful lemon scent, used in perfumery and household products, is a natural insect repellant, a stimulant, tonic, and deodorant. CLARY SAGE- Sweet and musky; Energizing, invigorating, uplifting and relaxing emotionally; Treats eye problems, indigestion, relieves aches and pains, PMS, depression, anxiety, tension, general debility and mental fatigue. Is a calming tonic, anti-inflammatory, soothing, anti-fungal, anti-spasmodic, aromatic, a gentle menstrual spasmodic, used in compresses, baths, and massages. Do not use during pregnancy. CLOVE- Mostly used in cooking; cures toothaches, reduce the pain of arthritis and rheumatism. Good for acne, athlete’s foot, bruises, burns and as an insect repellent. Can be used as a sedative, for sterilization, is antibacterial, antiseptic and prevents infections. Promotes clear intuition. COMFREY- A perennial herb used for it's dried or fresh roots, leaves & flowers. A natural skin binding/bandage, repairs damaged tissue. 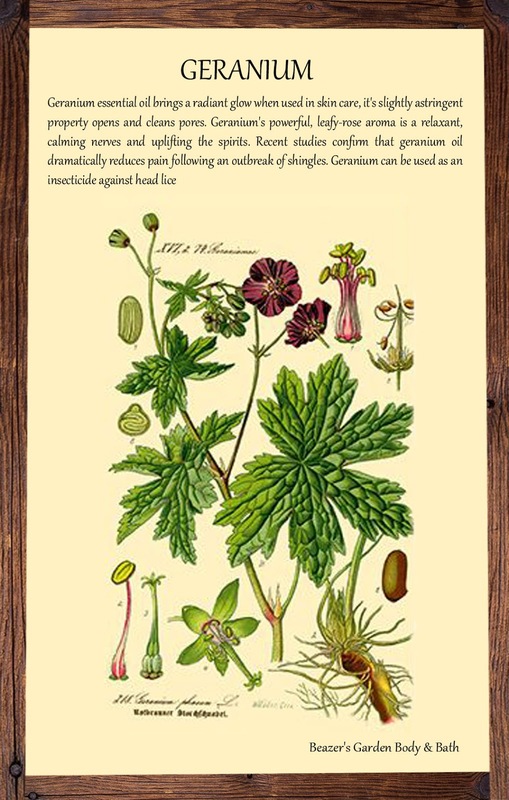 Used in ointments or poultices for sprains and bruises. 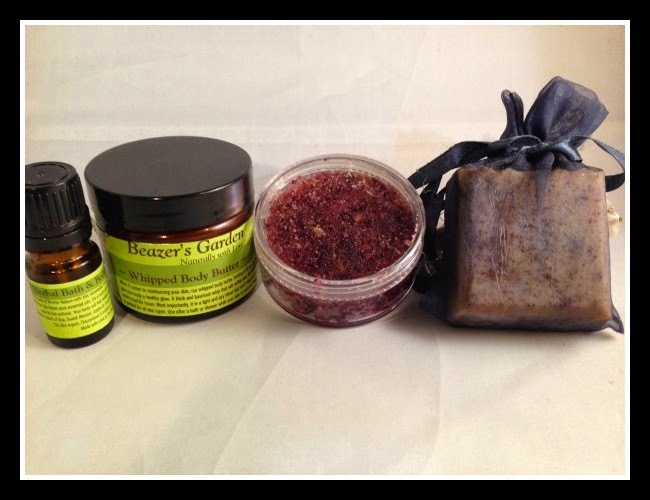 An astringent, anti-inflammatory, soothes bronchitis, acne & psoriasis. CYPRESS- Has a rich woody aroma. Is antispasmodic, beneficial to circulatory and vascular systems; is an astringent, styptic, sedative, soothing, clears and calms the mind, useful against insomnia; antiseptic, used in inhalations, vaporizers, baths, massage, gargles and compresses; reduces sweating, relieves fluid retention, chilblains, a tonic, helpful for cramps, reduces swelling, nervous tension. An insect repellent. EUCALYPTUS- A natural antiseptic that is effective against a wide range of bacterial and viral infections. Helps to reduce fevers, fights colds and flu, eases muscle aches. Is uplifting and invigorating. Clears and stimulates the mind, prevents drowsiness, a decongestant. Cleansing cools the body in summer, protects it in winter, anti-inflammatory, antiseptic, antibiotic, deodorizing, used in the veterinary care and as an insect repellant. FENNEL- An antibacterial with a slight “tightening” action on the skin. Rich in oleic, linoleic acids and essential fatty acids which are highly beneficial to the skin. Good for bruises, dull, oily and mature complexions, cellulite, and rheumatism. 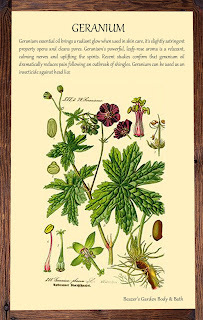 GERANIUM- Smells wonderful but works hard with a rich, sweet aroma. Good for multiple uses...Cleans the body, treats acne, bruises, broken capillaries, burns, congested skin, cuts, dermatitis, eczema, oily and mature skin; a mosquito repellent. Is useful against stress, uplifts the mind, good for depression and nervous tension; an astringent, balances, a tonic, stimulating, used in compresses, baths, mouthwashes, inhalations, anti-fungal, antiseptic, Wear for courage. GRAPEFRUIT- A tonic for depression. Good for acne, congested and oily skin, tones the skin and tissues. Good for cellulite. GINGER- Originally from China, Japan, India & West Africa. Has a nice warm spicy scent. 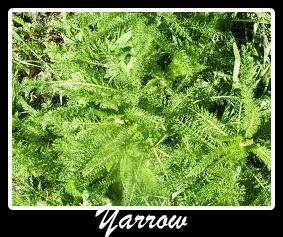 Sometimes used as a fragrance and is an excellent ingredient for bath oils and other cosmetics. Soothing properties are very beneficial to the skin. Stimulates circulation. Antiseptic, aids in digestion, helps colds, aches, and pains. Relieves nausea, motion and morning sickness. Analgesic. Correspondences: Love, power, Mars, Scorpio, Courage, money-attracting. HIBISCUS- Beautiful flowers, sweet scent. It is a natural source of alpha-hydroxy acids (AHAs). wear for intuition. Relieves high blood pressure and high cholesterol, as well as digestive, immune system, and inflammatory problems. It can also speed up the metabolism and help in healthy, gradual weight loss. HOPS- Anti-microbial and sedative, it calms, tones and softens the skin. The dried, flowering part of the plant is used to make medicine. Hops are used for anxiety, inability to sleep (insomnia) and other sleep disorders, restlessness, tension, excitability, attention deficit-hyperactivity disorder (ADHD), nervousness, and irritability. JASMINE- From France, China and Egypt. Has a flowery scent. Relieves nervous tension, depression, fatigue, an antidepressant, antiseptic, aphrodisiac, antispasmodic, expectorant, Can be a relaxant. JUNIPER- Antiseptic, a calming tonic, helps anxiety, insomnia, mental fatigue, astringent, body cleansing, good for acne, oily skin, greasy hair, used in masks, baths, vaporizers, massage, compresses, purifying, relieves indigestion, muscle aches and pains, is warming, helpful for arthritis and rheumatic conditions. Do not use during pregnancy. 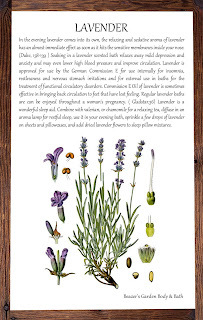 LAVENDER- The perfect all-around helper. A perennial shrub. cultivated in gardens, but found wild in mountainous countries, Flowers in midsummer helps relieve pain, balancing and normalizing, brings health and harmony to the body. A mild detoxifier, with a full, flowery aroma, uplifting and soothing. Used as a perfume, baking, cleansing and calming, alleviates stress, anxiety, depression, insomnia, headaches, migraines, athletes’ foot. 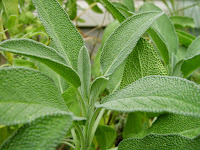 An antiseptic, anti-inflammatory, eases colds, used in inhalations, vaporizers, baths, massage. soothes acne, dandruff, diaper rash, sunburn, insect bites, stretch marks, bad breath, indigestion, muscular aches and pains, PMS, is an antibiotic, anti-oxidant, prevents scarring, treats burns and scalds, stimulates the immune system, a mood tonic. Experience the effects of lavender in my Refreshing Herbal Face Mist, Lavender Face Toner Cleanser or Bath and Body Essential Oils. LEMON BALM- Has calming effects. Relieves anxiety, poor sleep, nervous indigestion, has strong anti-inflammatory and antibacterial action. Lemon balm is classified as being calming, soothing, healing and tightening on the skin, whilst also stimulating circulation. It is thought to be great for acne and sunburned skin. LEMON VERBENA- An aromatic, ornamental plant, where leaves are used as a medicinal herb; calming, gently sedative, soothes abdominal discomfort. A tonic on the nervous system, counters depression. LEMON- A citrus fresh scent. A tonic purifies water, antioxidant, antiseptic, antibacterial, aids digestion, helps insect bites, tension headaches, alleviates oily skin. Astringent checks excessive perspiration. A tissue toner, good for cellulite. Energizing, clears the mind, depression reliever, refreshing, strengthening. Possible dermal irritation in some individuals, use with care. 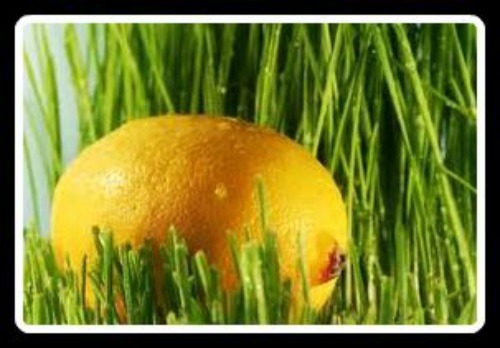 LEMONGRASS- Uplifting yet relaxing scent used in pharmaceuticals and perfumery. A natural painkiller with antiseptic and antioxidant properties. Improves circulation and digestion. Good for cellulite. Helps fight off infections, headaches, respiratory problems. A natural insect repellent. LIME- Used as an astringent, tonic and for anxiety and depression. Pronounced fragrance. Expressed peel oil is phototoxic, but whole fruit oil is not. See lemon oil. MARJORAM- A light, mild aroma, used mainly as a culinary herb but also helps to relieve pain, has warming properties, soothing and calming to body and mind, a sedative, relieves tension, insomnia, sprains, rheumatism, irritability, hysteria, provides comfort for those suffering from intangible emotions such as grief, loneliness, rejection, relieves headaches, used in inhalations, vaporizers, baths, massage, eases toothache, stimulant, antispasmodic, treats colic, respiratory problems. Do not use during pregnancy. MUGWORT- A culinary herb and used in traditional Chinese medicine. A digestive tonic, improves appetite, absorption of nutrients. Has been used for centuries for disorders and epilepsy, as it has mild sedative and antispasmodic properties. An infusion of the dried leaves and flowers helps expel pinworms. Mix the dry herb with honey and apply to bruises to fade them. ORANGE- A sweet, fresh scent that stimulates the mind and lifts energy. Contains vitamins A B C and E. Relieves cold-like symptoms. Is a sedative tonic, good to ease depression, anxiety, and nervous conditions. Is antiseptic, aids dermatitis, oily skin; Good for cellulite. Wear for intuition and luck. Experience the effects of orange in our Soy Wax Wafers and diffuser set. OAKMOSS- Wonderful fresh scent. The essential oil has antiseptic, emollient and expectorant properties. Used in aromatherapy to treat a headache or sinusitis. The fragrant substances of this lichen are widely used in the perfume industry. ORRIS ROOT- Used for “blood-purifying,” “gland-stimulating,” increasing kidney activity, stimulating appetite and digestion, and increasing bile flow. It is also used for a headache, toothache, muscle and joint pain, migraine, constipation, bloating, diabetes, and skin diseases. PALMAROSA- Good for skin infections, scars, sores, wrinkles, and acne. An antiseptic, cellular stimulant, moisturizes the skin, regulates sebum production, hydrating. PATCHOULI- Penetrating, long-lasting, musty, woody fragrance. An aromatic, medicinal, an aphrodisiac, an insect repellent, antiseptic, eases headaches, fever, treats skin complaints, has a regenerative effect on skin tone, used in perfumery, cosmetics, skin inflammation. Alleviates depression and anxiety, uplifting, confidence builder. Stimulant at low doses, sedative at high doses. Insect repellent. PENNYROYAL- A member of the mint family, pennyroyal is a strong purifier, antiseptic and freshener. A good insect repellent. Stimulating. Do not use if pregnant, can be abortive in high doses. *High doses can also cause death to the user. PEPPER- Cultivated as a spice, is a medicinal stimulant, aids digestion, warms the body, eases bloating, toothache, antiseptic, antibacterial, reduces fever. Wear for courage. PEPPERMINT- Has a refreshing aroma. Promotes overall physical and emotional wellbeing, uplifting, eases fatigue. Insect repellant, stimulating and strengthening, helps soothe headaches, antiseptic, antispasmodic, a decongestant, relieves coughs, colds, flu, used in inhalations, baths, cooling, and cleansing, soothes itchy skin. Is highly effective for travel sickness, nausea, and indigestion. Relieves muscle and joint pains. ROSE- Called the “queen of flowers”, has been cultivated for the last 3,000 years, originally from Iran. Its petals were once consumed as food and are a popular perfume. 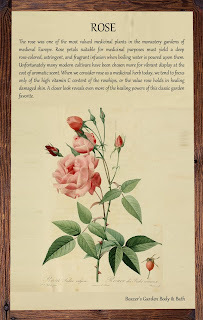 The rose has been a remedy for depression, an anti-inflammatory, a mild sedative. Eases anxiety, insomnia, nausea, PMS. Increases loving feelings and libido. Wear for luck. Rosewater is mildly astringent. Rose hips are a source of vitamins and are a tissue regenerator. ROSEMARY- An aromatic, evergreen shrub. Stimulating to body and mind, an antiseptic and gentle analgesic clears the mind, helps to relieve headaches and general fatigue, ease nerves. A tonic and astringent improves circulation, relieves fluid retention, stretch marks. Used in hair rinses, prevents dandruff. Compresses, massage, baths. Treats muscular sprain, arthritis, rheumatism, depression, memory loss, coughs, flu. BEST AVOIDED BY PERSONS WITH HIGH BLOOD PRESSURE. 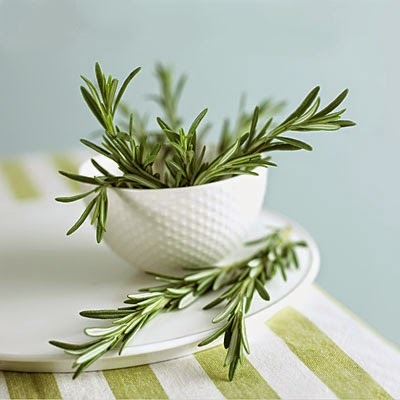 Experience the effects of Rosemary in our Herbal Hair Rinses. RUE- Strongly aromatic, helps reduce blood pressure, strengthens eyesight. Stimulates blood flow (menstruating women use caution), treats hysteria, vertigo. SAGE- A perennial, using oil, flowers, roots, and leaves. A powerful relaxant, energizing, and invigorating, uplifting and relaxing emotionally, helps to relieve depression, tension, mental fatigue, soothing and anti-inflammatory to the skin, helps to restore moisture to dry skin, calming to the circulatory system, can help relieve high blood pressure, antispasmodic. SANDALWOOD- Burned as an incense, used in perfume, calming and soothing, a woody smell, sedative and relaxing, relieves anxiety, tension, frees the mind from the past, remedy for insomnia, a balancing decongestant, relieves irritation, soreness, used in gargles, inhalations, vaporizers, reduces irritation from sunburn, helps dandruff, hives, allergic conditions, astringent, colic, hiccups, soothes heartburn, nausea, morning sickness, relieves itchiness, PMS. Semi-parasitic. SARSPARILLA- Antibiotic, treats skin problems like eczema, itchiness, rheumatism, debility, depression; anti-inflammatory, cleansing. Native Americans used it to enhance virility, tonic, and aphrodisiac induces loving feelings. Was the original flavoring for root beer. 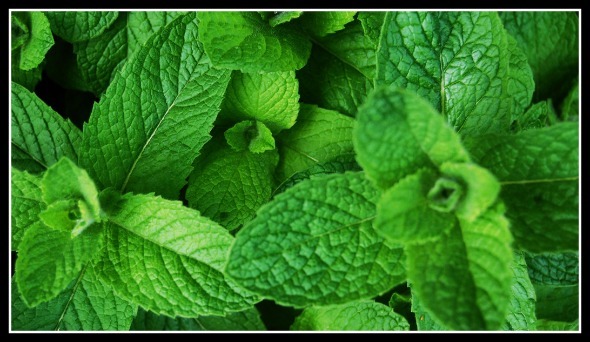 SPEARMINT- Similar beneficial properties of Peppermint. Better suited for children because it is milder. TEA TREE- Fights infection, boosts immune function. A powerful antiseptic, is 12 times as strong as carbolic acid or phenol, the widely used chemical disinfectant, hypo-allergenic, non-toxic, anti-bacterial, anti-fungal, insect repellant, Antiviral, fight colds and flu, used in mouthwashes, compresses, masks, foot baths, inhalations, vaporizers, cleansing, and cooling, soothes sunburn, effective against head lice, protects from infection, anti-parasitic, germicide. Relieves muscle aches and pains, minimizes most skin irritations, good for cuts and scrapes. Uplifting, purifying, regulating. THYME- An aromatic shrub used in cooking and infusions for coughs, colds, fungal infections, comforts the head, stomach, antiseptic and antifungal, decongestant/expectorant, used in poultices, infusions, baths, pillows, antiviral, antibiotic, good as a room diffuser during flu season, Counteracts the effects of aging, a remedy for hay fever, relieves bites and stings, pest repellant. VANILLA- A sweet and spicy scent. a delicious flavor ingredient in our baked goods; it also has a number of important benefits, including its ability to treat acne, improve hair growth, speed healing, reduce inflammation, prevent chronic diseases, protect the heart, and much more. YARROW- A creeping perennial, cultivated in Europe, Africa, North America the leaves and flowering tops are used in pharmaceuticals, in 1st aid treatments to heal wounds, as an astringent, helps in circulation, cramps, inflammations, and teas. A strengthening bitter tonic, anti-spasmodic, lowers blood pressure, stops internal bleeding. Avocado Oil – Easily absorbed by the skin, it is a good source of vitamins A D & E, amino acids, and sterols. Known to accelerate healing, recommended for chronic eczema and other skin disorders. Restorative. Benzoin Gum – A natural antiseptic and astringent with antioxidant and preservative properties. Promotes healing. Evening Primrose Oil – High in essential fatty acids, a source of gamma-linolenic acid. Astringent and sedative, it is an excellent treatment for dry, flaky skin and skin prone to eczema. Jojoba Oil- Highly penetrative and nourishing to skin and hair. It acts as a humectant and creates a protective film over the skin and hair shaft that helps keep moisture in. Rich in vitamin E with antibacterial properties, suitable for all skin types. Mimics collagen. Apricot Kernel Oil – Natural oil from apricot pits. An emollient similar in composition to almond oil, it has a softening effect on the skin. Helps to erase stretch marks and wrinkles. Oatmeal – A natural cleanser and toner, its mild exfoliating action makes it an excellent addition to facial masks. It has a slight bleaching effect and is said to help fade or remove age spots and other skin discolorations. Olive Oil – A natural sunscreen, very emollient and good for sensitive skin and babies. Palm Oil- Softening to the skin and makes an excellent, fluffy lather. Lanolin – The oils obtained from the wool of sheep, used as an absorption base in moisturizers and hair products. Castor Oil- Rich in fatty acids, it soothes and lubricates the skin. Acting as a humectant, it attracts moisture to the skin. Rosewater – A water-based dilution of the essence of roses used in cosmetics since the 10th century. 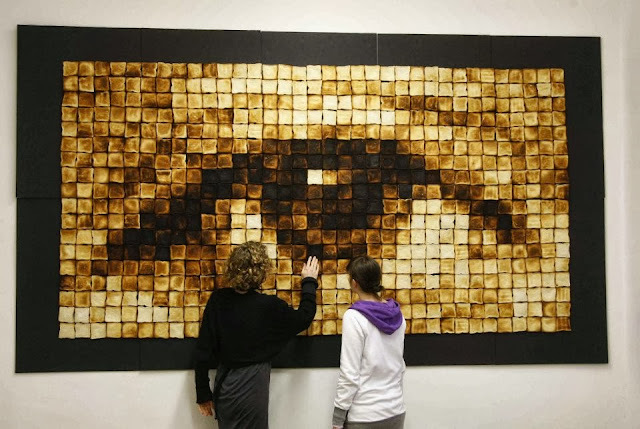 Used for conjunctivitis. Safflower Oil- With a very high percentage of linoleic acid, it helps to moisturize, nourish and restructure the skin. Vegetable Glycerin- A rich humectant, emollient, and lubricant naturally extracted from vegetable oils, glycerin has been used in cosmetic formulations for thousands of years; therefore, it is believed that glycerin helps the skin remain moisturized by drawing moisture to it. Sorbitol- This is a sweet liquid that is added to the soap for its great moisturizing properties and is made from berries. Sorbitan Oleate- This is an emulsifier, used to help the mixture of ingredients bond together. Soybean Lecithin- A Protein vegetable extract high in natural fatty acids. made from soybeans, this is a great skin conditioner. Grapeseed Oil- light and easily absorbed by the skin. Vitamins, minerals, and protein, great for all skin types. Cocoa Butter – A super emollient that softens and protects chapped dry skin. It softens pregnant skin and helps to erase stretch marks, aids in the treatment of skin irritations, and is used to soften and erase wrinkles on the neck, around eyes and at the corners of the mouth. Coconut Oil- Great for dry, itchy and sensitive skin, it doesn’t clog pores and absorbs readily into the skin. Organic Virgin Coconut oil: has been found to be the best source of monolaurin, a well known antiseptic substance found in breast milk, natural antifungal, moisturizer & protectant. Shea Butter/ Oil: A butter obtained from the nut of the Mangifolia tree in Central Africa. a natural sunscreen, it protects the skin against weather, sun, elasticity, and aging. It is a well-known anti-inflammatory to assist cutaneous dryness, dermatitis, and dermatoses, eczema, solar erythema, and burns. It is a well known in helping moisturize while providing a silky protective barrier to all skin types. Vitamin E: anti-oxidant, protectant, a natural preservative. Aloe: long been considered to be a premier botanical for moisturizing and healing the skin and damaged or dry hair. A natural sunscreen, soothing and moisturizing. Use for cuts, scratches, bruises sore or irritated skin, for burns, sunburns, X-ray burns. Sweet Almond Oil- nourishing, containing vitamin D and other beneficial vitamins, minerals, and proteins. Great for dry and irritated skin. Healing and moisturizing, with a sweet, pleasant fragrance. Wheat germ oil- high in antioxidants, vitamin e, a, b, minerals, and protein. A natural preservative. Do not use if you have a wheat intolerance. Honey: the sweet material taken from the nectar of flowers and manufactured by bees. It is high in vitamin C and promotes collagen formation in the skin. It is a natural humectant (drawing in moisture) antibacterial & antimicrobial. Used since Egyptian times for medicinal and cosmetic purposes. Honey is full of vitamins, minerals, amino acids, and enzymes. Has an emollient property, is soothing and humectants. Emollients make the skin feel softer and smoother, reduce rough feeling, cracking and irritation. Honey is cleansing and antibacterial. Bacteria cannot live in honey, which demonstrates its natural preservative properties. a natural antioxidant and anti-inflammatory. Witch Hazel- A natural astringent. Skin healer protects from infection, has a cooling effect on inflamed skin. Relieves insect bites and burns.